I’ve never been much impressed by Julia Roberts in terms of her looks as she resembles her brother Eric Roberts way too much for my tastes. As an actress she also never did much for me although I’ll freely admit that I have to pretend there’s something in my eye if I’m watching her death scene in “Steel Magnolias” with other people. And I thought the notion of Tess Ocean in “Ocean’s Twelve” being a dead ringer for Julia Roberts was a pretty funny one since this meant that Julia Roberts ended up playing a character that was playing that character’s idea of Julia Roberts. She must have a terrific sense of humor since she took the chance to poke fun at her own media image of herself in that convoluted role. So given how I feel about Julia Roberts, why did I watch MARY REILLY? Well, since John Malkovitch was co-starring and the movie was based on Robert Louis Stevenson’s “The Strange Case of Dr. Jekyll and Mr. Hyde” I was intrigued enough to give it a look and was pleasantly surprised that I ended up enjoying it a helluva lot more than I thought I would. Right from the start we know more about what is going on than Mary Reilly since we know that Henry Jekyll is shooting up with his homebrewed funky cold medina and going out at night doin’ all kinds of wild thangs as Edward Hyde. But that doesn’t take away from the enjoyment of the movie as this isn’t meant to be an out-and-out horror movie, even though there are some outstanding horrific moments and we never see the transformation from Hyde to Jekyll until near the end. No, this is more of a psychological horror film with a really weird and disturbing romantic triangle being formed between Mary, Jekyll and Hyde. This movie is a great example of what I think is meant by Gothic horror with some unusual sets, such as Dr. Jekyll’s lab, which can only be reached by a walkway suspended from chains over what might as well be a black bottomless pit. Jekyll’s house seems forever dark and claustrophobic and most of the scenes take place either at night or in darkened, shadowed rooms. Mary and Dr. Jekyll form a creepy bond as he relies more and more on her and in a strange way, Mary becomes an accomplice in the dark and terrifying deeds of Edward Hyde as she takes messages back and forth from Dr. Jekyll to Mrs. Farraday (Glenn Close) the madam of the bawdy house where Hyde commits some really despicable acts that Jekyll gladly pays to hush up. I really liked the performances of Julia Roberts and John Malkovitch here. Julia Roberts manages to disappear into the character of Mary Reilly and conveys a lot of strength and vulnerability. We can see how she’s attracted both to Henry Jekyll’s intelligence, gentleness and compassion but also to Edward Hyde’s brutality and raw sexuality. John Malkovitch makes an interesting choice in how to play Jekyll/Hyde. He plays Jekyll as an older man, with gray hair and a scruffy mustache, slightly on the heavy side, slow and deliberate. Edward Hyde is thin as a scalpel, fast as a bullwhip, clean shaven, young and virile with a flowing mane of thick black hair. I wouldn’t be surprised if he took his inspiration from Jack Palance, who played the roles of Dr. Jekyll and Mr. Hyde in a memorable 1968 Dan Curtis production in a similar manner. The strength of MARY REILLY comes from us seeing major events from the classic Jekyll and Hyde story distilled through the eyes and sensibilities of Mary and the rest of the house staff and it’s really interesting to watch such a well-known story unfold through the eyes of secondary characters. 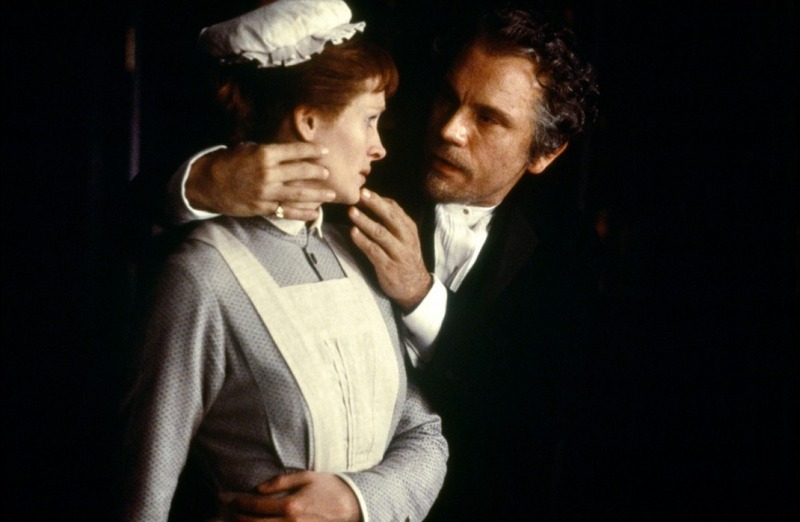 The footman Bradshaw (Michael Sheen) speculates that Hyde might be Jekyll’s illegitimate son and at one point he even says in frustration; “Doesn’t anybody besides me notice they look quite a bit alike?” And the butler Mr. Poole (George Cole) is obviously jealous of the growing relationship between his master and Mary and that colors his treatment not only of her but also of Dr. Jekyll. So should you see MARY REILLY? I’d say yes. It’s by far the most unusual version of “The Strange Case of Dr. Jekyll and Mr. Hyde” that I’ve seen in terms of the way the subject matter is handled. It’s got murder and mayhem but it’s focused on character and atmosphere instead of special effects. The acting by John Malkovitch and Julia Roberts is remarkably strong and powerful. This could be one of the few horror movies that guys can watch with their wives or girlfriends and due to the subject matter and acting be considered wonderfully sensitive and yet have their bloodlust satisfied. Enjoy. Very well said on how you described the attraction that Mary Reilly had between Dr. Jeckyll and Mr. Hyde. I liked John Malkovich before this movie and made me a big fan after this movie! Glad you enjoyed the review. Thank you for reading and leaving a comment! Don’t be a stranger, hear?